With preparations for Mòd 2017 in Lochaber well underway, An Comunn Gàidhealach would like to remind any potential senior and junior piping competitors that the entry deadline for Mòd 2017 piping competitions is Friday 7th July 2017. Any late or incomplete entries submitted after this date will not be accepted. The Mòd will make a welcome return to Lochaber for the first time since 2007 with junior and senior piping competitions taking place at Lochaber High School on Saturday 14th October 2017. Both senior and junior entries for any piping competitions must be submitted to An Comunn Gàidhealach by Friday 7th July 2017 and entries can be submitted online at: enter.ancomunn.co.uk. An entry form can also be downloaded from the website and entered by post. Details about the competitions themselves can be found by downloading the syllabus here. Please note that junior competitions C108 (March) and C109 (Strathspey & Reel), previously for 13-15 years, are now open exclusively to U15. Competitions C130 (MSR) and C131 (Jig), previously 16-18, are now open exclusively to U19. Junior competitors are also reminded of the open junior Pìobaireachd own choice competition for under-19’s. There is also the addition of a new competition for the playing of a slow air for U13 chanter players. The Royal National Mòd takes place in Lochaber between 13th and 21st October 2017. For any further information, please contact An Comunn Gàidhealach on 01463 709705 or by e-mail: info@ancomunn.co.uk. We have a new adult competition this year: Competition B372. 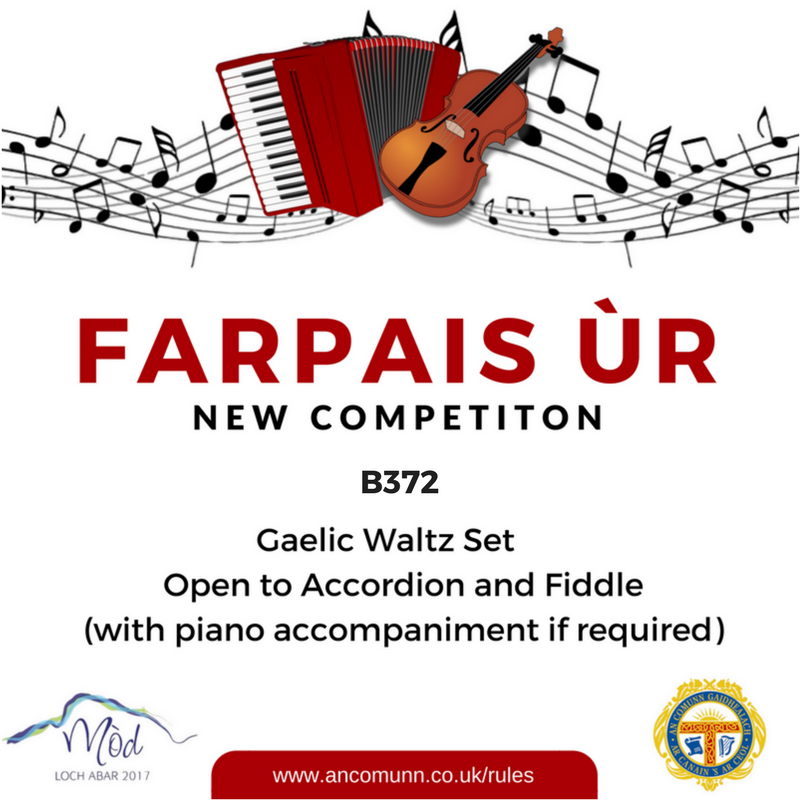 This competition is open to Accordion and Fiddle players. More information is available from the Royal National Mòd Syllabus.